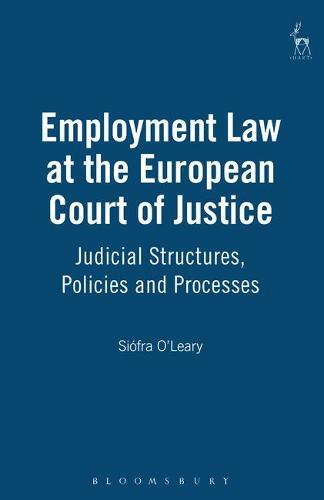 Despite the fact that the case-law of the European Court of Justice on employment related issues has become increasingly erratic of late,there is no denying the centrality of the Court's role in the development of EC employment law. Though concentration on the work of the Court of Justice may no longer be in vogue, this book examines its contribution in the employment law field in its political and economic context, as well as with reference to the juridical structures within which the Community's judicial arm is obliged to operate. The objective is not simply to critique the employment jurisprudence of the Court but also to examine the procedural, operational and structural context in which the Court of Justice is obliged to work and to reflect on how this context may affect the jurisprudential outcome. The book focuses, in particular, on the shortcomings of the preliminary reference procedure. When the Court of Justice hands down decisions in the employment law field, Article 234 EC dictates a particular type of judicial dialogue between it and the national referring courts. It is contended that the dual dispute resolution/public interest nature of the Court's role in the preliminary reference procedure goes some way to explaining why its answers are often regarded as unsatisfactory from the perspective of the referring court and "users" of EC law generally. The book further outlines the developing Community policy on employment and reflects on the effect which this nascent policy may have on the balancing exercises which the Court is inevitably called upon to perform in a variety of social policy contexts. Finally, part two of the book examines specific substantive areas of EC employment law. The policy considerations at play in the case-law of the Court are discussed in detail, as is the coherence of this case-law with the Community's political stance on employment.